Windows are one of the most important parts of a home. They add to the visual appeal of a room and they also add to the curb appeal of a home. In addition to adding to the aesthetics of a house, they also provide a functional aspect. With all of the different types of windows out there, you have many options to choose from when picking a window. If you’ve thought before about choosing glass block windows, you should think again, as it’s best to avoid this type. Read on to find out why you should avoid glass block windows and what to choose instead. Glass block windows date back to the 1900’s. They are blocks made of glass and acrylic that can be stacked up on top of one another. A special mortar cement is then used to put them into the wall. They can also be frosted or colored for some extra security. Glass block windows were very often found in bathrooms and foundation walls, too. They faded in popularity for a while. However, they have become stylish once again for their environmentally friendly features. Architects and homeowners are opting for glass block windows in their walls that divide two rooms. They’re even putting them in bedrooms and dwelling areas like the living room. What are Some Positives About Glass Block Windows? Glass block windows often go in basements, especially at the top of a wall. They often are not operable because the window is too high up on the wall for a person to reach. Due to their thick glass, these windows can provide a high level of security. A traditional window may easily be broken into. The basement’s location in the house has space where breaking in allows for an easy entry into a home. Having more security and blocking off this entry point can be a strong advantage to having a glass block window. Some glass block windows have Energy Star efficiency ratings. There are a ton of glass block windows that are low-e; this means that they can reduce the amount of heat that will get into space. If you can reduce the amount of heat transfer, you can seriously lower your energy bills, too. Their ability to insulate has made some people turn to them now that environmentally friendly home features have soared in popularity. What are Some Negatives About Glass Block Windows? One of the major negatives is that many home builders and designers find them to be less attractive. Since they were popular in the early 20th century, they give off an extremely outdated feel. 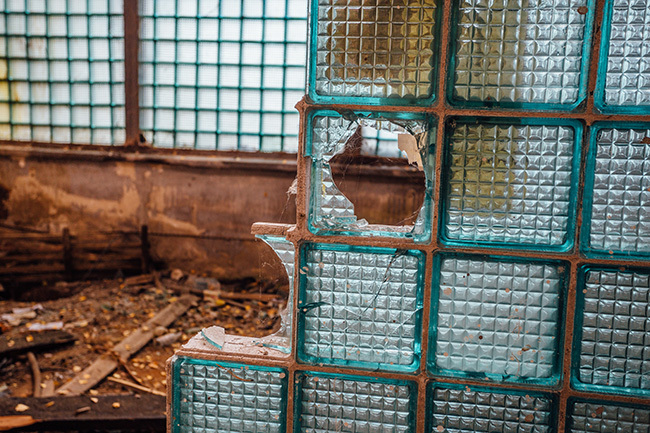 Another common belief is that the glass block window was inserted in a place where a poor building or low-quality material was used, such as in a corner. Whether or not this is the case, it’s a misconception that influences people’s views of glass block corner. Another reason some people don’t like the look of them is that they are very cloudy when looking through them. This can be positive when they are placed in bathrooms, or in a place where you don’t want people to see through the window. However, windows are often chosen for the natural light that they emit. A common popular window trend is to have them be large and allow a ton of light and air into a room to open it up. A glass block window may then serve to make a room seem smaller since it doesn’t let as much light in. What is the Cost of Making and Installing a Glass Block Window? Some homeowners may try to install windows or do window work on their own. However, one major negative to glass block windows is that they are not easily made or installed. The glass blocks have to be exactly and precisely created, cut, measured and laid down. Only an experienced professional would know how to do this in an effective way. If you were to hire someone who does not have the proper experience, you may risk hiring someone who does not do a stellar job and leaves cracks or holes between the blocks in the window. One of the major risks with poor installation would be that moisture can seep through the glass and cause damage to your home. Also, the moisture can build up and cause mold to grow gradually. You may not be able to see the mold at first because it can be invisible to the naked, untrained eye. However, eventually black mold will form and you will readily see it on the wall and nearby areas. Are Glass Block Windows Durable? One common misconception is that because some glass block windows tend to be strong, they can bear a ton of weight. However, you never want to have them be overloaded because they can slowly, over time, start to crack. This poses a major safety hazard for anyone who may lean against the window and fall out if the glass were to break. In addition, given the weight of these types of windows, you need to make sure the floor below is safe and is able to bear the window. If it cannot, you take a risk of having the floor buckle or crack below it. Obviously, this would pose a serious safety hazard. Can They Allow Fresh Air Into a House? One of the main points of having a functioning window is that is can open up and allow air into the house. Glass block windows are not functional, however, and so they cannot accomplish this important task. Since they are often used in basements, they additionally cannot help to ventilate the stale air that often accumulates in areas of the home that are infrequently visited. Since they don’t open, they also cannot serve as an egress in the event of a fire or emergency within the home that required evacuation. Glass block windows may be a feature that you’re considering for your home, but there are several reasons why they are not the best option for you. In addition to posing safety hazards, they cannot ventilate a room and they cannot serve as an exit in emergencies. While they may have some pros such as being more energy efficient, it’s best to avoid glass block windows and save yourself the trouble that comes with them. There’s no competition when it comes to glass block windows. To put it briefly, they are unattractive, they don’t emit enough natural light since they are small in structure, they are expensive and difficult to install, they are not durable, and you won’t get the proper ventilation in your home with glass block windows. You’ll want something that’s popular amongst many homeowners across the country and that’s vinyl glass windows. You’ll notice the difference in energy efficiency, durability, ventilation, and these windows have large glass panels which allow more natural light to get in. At Feldco Milwaukee, we offer many different colors and styles to fit the decor of your Milwaukee home. Speak to a product specialist and get a free quote today.